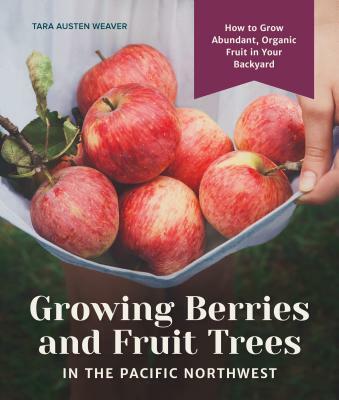 Growing Berries and Fruit Trees in the Pacific Northwest: How to Grow Abundant, Organic Fruit in Your Backyard (Hardcover) | Eagle Harbor Book Co.
"Learn how and when to plant fruit trees in your home garden—and how to maintain them for the optimal yield." "Food writer [Tara Austen] Weaver (Orchard House) combines a horticultural guide and culinary treasure chest between the covers of one instructive book. Focusing on fruits and berries—some common (strawberries, apples), other exotic (quince, lingonberries)—the text runs through how to prepare jams, curds, and sauces while starting from the ground up, literally. Highlighting soil maintenance and plant placement, Weaver discusses planting, cultivating, and harvesting, all with an eye to creating preserves [...] Farmers everywhere will learn and benefit from Weaver’s wide scope of knowledge." "[Tara Austen Weaver's] new book, Growing Berries and Fruit Trees in the Pacific Northwest, will lead you to sweet, sweet success." "Tara Austen Weaver's 224-page guide [does] not disappoint." "One look through Tara Austen Weaver's new book Growing Berries and Fruit Trees in the Pacific Northwest is all it takes to leave you dreaming about calling it quits on wherever you live now and hightailing it to greener pastures." "Growing Berries and Fruit Trees in the Pacific Northwest is well written, beautifully laid out and a great introduction to its topic. For many gardeners it could be the only book on the subject they will ever need."